I have just finished a Language and Literacy for 0-5 year olds as part of my studies. It was a fantastic unit and I learnt a lot from it. My sons have benefited from the knowledge that I gained during the course of the unit. One thing that I implemented for R was a writing implement caddy. 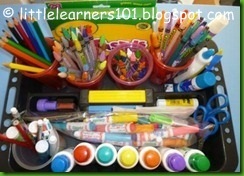 This contains all his ‘school’ stuff, including pencils, crayons, glue, scissors, stamps, do-a-dot markers, pens, markers, whiteboard markers, and stickers. The ideas of the caddy is that R will have access to these materials whenever he chooses. he can independently select the materials he wants to use when he wants to. When we do our activities during the day, R is free to select whatever writing implements he wants to. In conjunction to this, R also has his own writing journal. This is an A4 notebook that is kept with the caddy to encourage exploration of the materials in the caddy. It has been a big hit. R is motivated by being able to make choices and independently prepare for his activities.